What Can I Do With an Online Doctorate in Curriculum and Instruction? Earning a doctoral degree affords business professionals the opportunity to advance to executive-level positions or transition into academia. For individuals who already possess a master’s degree, there are two options: a doctorate in business administration (DBA) or a Ph.D. in business administration. A DBA is more practice-oriented can help established professionals move into management and research positions at universities, corporations, and other organizations. A Ph.D. in business administration — while similar — is more research-focused, and students pursuing this path are more likely to pursue teaching and research positions at universities. Opportunities for business research professionals continue to grow as companies increasingly rely on data analysis and market research to conduct business. According to projections by the Bureau of Labor Statistics (BLS), employment for operations research analysts will grow 27% from 2016 to 2026, and opportunities for postsecondary teachers will increase 15% during the same period. 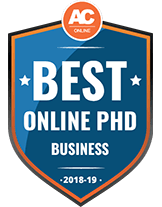 Students enroll in online business PhD programs for many reasons, including a flexible learning environment as they follow the steps necessary to take their career to the next level. The advanced degree can also mean the potential to earn a higher salary and enter more specialized positions. Find out which programs are at the top of the list by reviewing our Best Online PhD in Business Degrees for 2017. Saint Leo University offers a Doctor of Business Administration for students who hope to advance their careers in teaching, consulting or academic leadership. This degree can be completed online and is accredited by the Accreditation Council for Business Schools & Programs or ACBSP. It focuses on the creation of sustainable and vibrant organizations and includes courses such as Organizational Behavior and Social Responsibility, Analytics for Decision Making and Strategic Management in Global Organizations. Students can opt for the teaching or consulting track and complete a practicum that relates to their chosen track. They'll enhance their research and critical thinking skills and work on a dissertation, in which they'll design an original essay related to the field of business or management. Many Doctor of Business Administration graduates land positions as business teachers, economists, financial managers, college professors or consultants. They can be seen working as professionals at Penn State University-Harrisburg, Cobbham Inc. and Private Consulting Practices. The Doctor of Executive Leadership at University of Charleston is designed for students who wish to maximize their exectuive value to various organizations and institutions. It can help them advance their careers by expanding their knowledge on research, strategy, business theory and leadership. This is a cohort style program, which is offered online and requires a 5-day residency at the start of each year of study. It includes courses such as Generating, Conserving and Transforming Knowledge, Leadership Theories and Perspective and Conceptual Frameworks in Leadership. Students may earn a Doctor of Executive Leadership at University of Charleston in as little as 3 years. Admission requirements include official transcripts from all graduate colleges and universities attended, letters of recommendation, a 5- to 7-page paper that discusses why a student would like to earn this degree and a resume that outlines at least 5 years of experience in a leadership role. Students with the desire to effectively design human capital development programs may benefit from a PhD in Human Capital Management from Bellevue University. This program focuses on up-to-date knowledge and practice related to human capital development that can advance the performance of an organization. The coursework in this degree is divided into 4 modules that concentrate on a process or concept that can help an organization succeed. These 4 modules include Strategic Human Capital Management and Productivity, Linking Human Capital to Organizational Outcomes, Human Capital Leadership and Introduction to Measurement and Measuring, Analyzing and Assessing Human Capital Effectiveness. To graduate with a PhD in Human Capital Management, students must complete a dissertation, which is an applied research project that is performed in their company or an approved company they have access to. Prospective students must hold a master's degree, have 5 years of work experience and submit a resume as well as a statement of interest, letter of recommendation and a nomination from their employer. A Doctor of Philosophy in Business Analytics and Decision Sciences is available at Capitol Technology University. The goal of this program is to teach students how to use data to make management decisions. It is primarily taught online by data professionals who have hands-on experience helping all types of organizations make data-centric decisions. To graduate with a Doctor of Philosophy in Business Analytics and Decision Sciences, students must complete 54 credit hours and courses such as Fundamentals of Doctoral Learning, Analytics and Decision Analysis and Professional Ethics and Leadership. In addition, they must work on a dissertation, which they will prepare for publication. To apply for this program, students must hold a master's degree in business, analytics or a related field and have at least 5 years of relevant work experience. After graduation, students will have high-level critical thinking and leadership skills and know how to use data effectively. At Wilmington University, students may earn a Doctor of Business Administration online. This degree is specifically designed for students who would like to develop into senior managers or leaders who hope to further their business skills and knowledge. It includes 54 credit hours and involves a dissertation or research project. Although students can complete all courses in 2.5 years, the dissertation or research project typically takes 1 to 2 years to complete. All Doctor of Business Administration students are required to attend a residency, which is 2 days long and involves workshops as well as a consultation where students will work with faculty members to plan their dissertation. Prospective students can apply by submitting their official bachelor's and master's degree transcripts, a current resume, 3 letters of recommendation and a statement of goals and objectives. In addition, they'll need to participate in a faculty panel interview and complete writing, critical thinking and finance assessments. Students who are interested in landing leadership positions as industrial organizational psychologists should consider the online PhD in Business Psychology at The Chicago School of Professional Psychology. Students who hold a bachelor's degree can complete this program in 5 years of full-time study while those with a master's degree can graduate in 3 years if they enroll on a full-time basis. This program includes courses such as Adult Development and Work, which focuses on career development theories and Virtual and Global Leadership, which discusses techniques on managing and motivating virtual teams. Students who enter the program with a bachelor's degree will be required to complete two 300-credit-hour internships that must be approved by the faculty internship supervisor. In addition to holding a bachelor's or master's degree in psychology, behavioral sciences or management, prospective students must submit their official transcripts, GRE scores and 3 letters of recommendation. After graduation, students often find work in nonprofit or for-profit organizations where they collaborate with CEOs, supervisors and human resource professionals. Though many business professionals work toward obtaining a DBA or a master of business administration (MBA), the two degrees differ significantly from one another. Master’s students typically plan on becoming consultants, managers, or other business specialists, while doctoral students spend many years in the workforce and aspire to research-oriented jobs advancing business theory and practice. Accordingly, an MBA studies practical business and management skills, and doctoral programs focus on business theory and scholarly research abilities. Unlike a master’s degree, an online DBA or online Ph.D. in business can lead to a job as a tenured university professor. What Can I Do With an Online Doctorate in Business Administration? Earning a DBA online can lead to varying career paths in many fields, and DBA graduates can expect higher salaries than MBA holders. The same is true for Ph.D. graduates, and both doctoral degrees qualify you to conduct extensive research into business operations and theory. Ph.D. and DBA holders become versed in emerging business research, learn to analyze business processes, and leverage their new skills for jobs at colleges and universities. Others employ their know-how as operations analysts, market researchers, and business analysts. In addition, enrolling in DBA programs online provides the advanced management, finance, and strategic leadership knowledge you will need to become a top executive or senior business consultant. DBA holders can oversee departments, direct global business operations, and advise C-suite executive strategy. DBA graduates typically possess a great deal of responsibility and receive compensation accordingly. According to Payscale, DBA holders earn $120,000 per year on average, while MBA holders take home $85,000. Earning a Ph.D. or DBA online can lead to many varying career paths, and you can find some common job titles for these degree holders below. Read on to learn about some of the typical duties, responsibilities, and salaries of DBA and online Ph.D. in business graduates. CEOs direct all major business operations in an organization. They set long-term objectives, decide the overall direction of a company, and oversee high-level employees such as presidents and vice presidents. Management consultants or management analysts help organizations improve their efficiency, profitability, and productivity. They usually work for a consulting firm, which deploys them to different companies where they observe and strategize. These professionals help organizations improve and reach their goals. They develop strategies to adjust an organization’s culture, structure, goals, policy, and workforce. Business analysts collect data on an organization, identify inefficiencies, and propose solutions to the problems they encounter. Senior business analysts usually handle more complex issues than entry-level or intermediate analysts. Salaries for graduates of online DBA programs vary based on location, employer, industry, and work experience. Some states support highly lucrative industries, and certain employers offer especially generous compensation packages. Plus, employers typically prize workers with more professional or educational experience, and a doctoral degree can significantly increase your salary potential. The highest paying industries for top executives include computer equipment manufacturing, textile mills, and financial services. Chief executives in each of these fields make well over $250,000 per year. General and operations managers earn the most in banks, investment firms, and oil extraction companies. DBA online programs typically only admit students with significant business experience, and many require around five years of work in a managerial role. Applicants also must generally possess a related graduate degree such as an MBA or a master’s in management. Many online DBA programs require a minimum college GPA of around 3.0 and expect prior coursework in accounting, finance, and economics. Plus, some programs require or recommend the Graduate Management Admission Test (GMAT) or Graduate Record Examinations (GRE). Admitted doctoral students generally must complete 60-90 credits to graduate. Doctoral candidates usually spend 3-4 years working through the curriculum, which includes several advanced business and management classes, along with a dissertation. Dissertation research often spans 1-2 years, but requirements vary, even between online DBA programs accredited by the same organization. Though some students complete programs entirely online, many require some on-campus coursework, including in-person intensives, which generally run for 1-3 weeks. In this course, students explore the latest theories and trends in organizational development. Learners assess an organization’s current strategies and suggest changes that improve operations. They may study organizational ecology and lean operational strategy, among other theories. Plus, students examine how organizational change can affect key stakeholders. Students observe how to evaluate overall business performance, estimate cash flow, assess risk, manage growth, and analyze investment opportunities. They also may learn to collect reliable financial data and make decisions based on that information. This course prepares students for work as business analysts and operations research analysts through inquiry into business processes and improving efficiency. Students develop business intelligence strategies that help them make informed decisions and ensure long-term organizational success. Learners will explore how to make strategic decisions when confronted with common ethical dilemmas. Students also learn to foster values-based company culture and train employees in ethical decision-making. A course in research design prepares doctoral candidates to work on their own dissertation projects. Students gain experience identifying a research problem, determining the appropriate methods, and making hypotheses. By obtaining a familiarity with common social research methods, they learn to craft persuasive scholarly arguments. 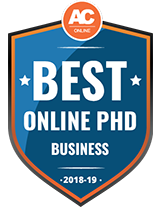 Ph.D. and online DBA students typically complete a dissertation, or an extensive original research paper appropriate for publication in a peer-reviewed academic journal. The research usually aims to advance business theory or practice and satisfies a portion of the program’s credit requirements. Traditional dissertations consist of five chapters: introduction, review of relevant literature, methods, findings, and conclusion. Some online DBAs require students to report to campus for some on-site seminars or intensives during their studies. The on-campus requirement sometimes coincides with the beginning of dissertation research, giving online students the opportunity to consult with faculty advisers and develop a research plan. In addition to completing a major research project, students must defend their findings in front of a panel of faculty members. Doctoral candidates must explain their research methods, summarize major discoveries, and field questions from the committee. After the defense, the committee decides whether or not to award a degree. Though online DBA programs may vary considerably, most of them develop similar skills. Read on to learn about some of the competencies that DBA students gain during their studies. Managers learn to make ethical and moral decisions in executive roles. They also explore committing to informed financial decisions. Doctoral candidates develop advanced qualitative research skills and study common methods for conducting interviews, in addition to analyzing data. Students become familiar with the strengths and constraints of quantitative research. They learn to design surveys, identify target populations, and select research methods. Through writing courses and dissertation research, students learn to structure an argument and convey complex research. Research and management coursework endow students with the theoretical and practical knowledge needed to become more effective leaders. Professional associations can provide immense value to online DBA holders. These organizations provide access to industry publications, scholarly research, online education opportunities, and networking conferences. Associations enable business professionals and academics to establish important connections, trade ideas, and collaborate to advance their field. Plus, members of professional organizations can make the most of their membership by volunteering for events, joining a committee, or serving on their board. While some professionals join multiple associations, some organizations may fit your career and interests better than others. Those pursuing a career in academia might consider joining a research-oriented association, such as the Academy of International Business (AIB). These organizations typically publish peer-reviewed journals and encourage scholarly inquiry. Plus, graduates should explore associations in their specific business field. We have compiled a list of some popular associations for business administration graduates below. AIB joins scholars and professionals to advance education and practice in international business. The association encourages research in the field and facilitates collaboration between academics, business professionals, and government employees. Founded in 1885, the AEA fosters discussion and publication of economics research. The association publishes journals, hosts conferences, and unites economics specialists in academia, government, and business. AMA, established in 1923, aims to improve performance and encourage professional development among managers. Members gain access to a variety of educational resources, including seminars, webcasts, scholarly texts, and research. This association supports business analysts worldwide by providing industry research, training opportunities, and certification programs. Plus, the association operates a jobs board and maintains professional standards for business analysis workers. IMC USA supports management consultants looking to establish and grow their consulting businesses. The association advances management consulting through certification opportunities, professional development resources, and national conferences.